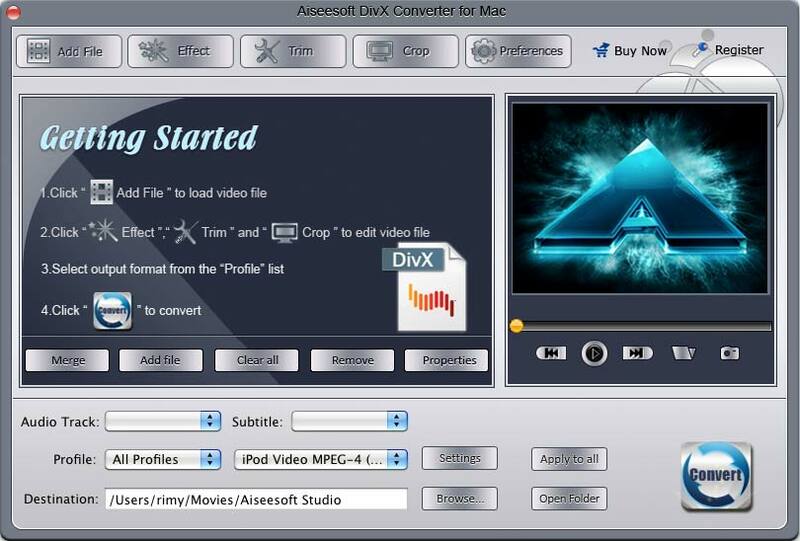 Aiseesoft DivX Converter for Mac is the powerful Mac DivX Converter to convert any video (including HD video) to DivX, such as convert MP4 to DivX, convert AVI to DivX on Mac. The mainly supported input video formats include: MPG, MPEG, MPEG 2, VOB, DAT, MP4, M4V, TS, RM, RMVB, WMV, ASF, MKV, AVI, 3GP, 3G2, FLV, SWF, MOD, TOD and HD video.Provide the fastest conversion speed, completely support Intel dual core CPU or Power PC G4/G5. The powerful Mac DivX Converter to convert any video (including HD video). ...... More specific output parameters are available for you to adjust to perfect fit for your player. With Aiseesoft DivX Converter for Mac, you can adjust output video Brightness, Contrast, Saturation and Volume. Checking Deinterlacing is to convert interlaced video to the progressive one to avoid mosaic. Using "Trim" functions to get any time-length clips from source file exactly by setting the start and end time or casually drag the slider bar. This Mac DivX Converter provides you the function of merging all the files you choose into one output file. Associated with intuitive interface, a few clicks are all you need to convert your video. Qweas is providing links to Aiseesoft DivX Converter for Mac 3.2.20 as a courtesy, and makes no representations regarding Aiseesoft DivX Converter for Mac or any other applications or any information related thereto. Any questions, complaints or claims regarding this application Aiseesoft DivX Converter for Mac 3.2.20 must be directed to the appropriate software vendor. You may click the publisher link of Aiseesoft DivX Converter for Mac on the top of this page to get more details about the vendor.